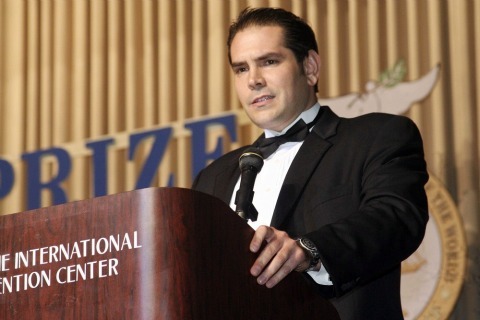 Santa Barbara resident Demetri Argyropoulos, CEO of Prima Worldwide has been awarded the 2010 Gusi Peace Prize. The award recognizes the brilliant examples of those working toward the attainment of peace and respect for human life and dignity. Demetri was honored with the award for the exemplary contribution to peace and human rights in economics and leadership at an award ceremony in Manila, Philippines, November 24. The Gusi Peace Prize was established in 2002 a charitable foundation who’s main objective is to give proper recognition through the conferment of awards of excellence and distinction to individuals or groups worldwide who have distinguished themselves as brilliant exemplars of society or who contributed toward the attainment of peace and respect for human life and dignity. The Gusi Foundation aims to honor and award distinguished individuals or groups worldwide with exemplary contributions in scientific discoveries, politics, academe, performing arts, literature, medicine or physiology, journalism, humanities, physics, chemistry, religion, business and philanthropy, economics, internationalism and others. The Gusi Peace Prize was established in 2002 and has flourished as the Asian region’s foremost awarding body, closely compared to the Nobel Peace Prize. Detailed information on the Gusi Peace Prize is available on the website .